Like most other wedding features, the buttonhole is an outfit piece that comes with tradition and custom. Just like the wedding flowers that originated in ancient Greece, so too did the grooms flower lapel – to mark as a ward against any evil spirits trying to turn his heart against his bride. Nowadays, however, this ritual trinket doesn’t have to be taken so seriously. As one of the most longstanding and rare opportunities for a groom to personalise and style a part of his outfit on the wedding day, why not consider a more unique approach to the boutonniere? We are huge fans of the classic floral buttonholes, particularly when they match the overall wedding scheme and bridal flowers to give the entire wedding décor a collective, polished effect. A classic white rose with its green stem will never fail to exhume elegance and grace. However there are many other styles and floral arrangements, particularly in bright and bold new colours that will work just as well on the groom’s collar. As chic and classical as floral buttonholes are, we are also currently loving those more vintage, personalised accessories that grooms are embracing. Why not inject a bit of fun with a more quirky and alternative lapel choice. After all a wedding is nothing if not a celebration, and where’s the party without a little fun? Incorporate this style feature into the entire wedding party, with coordinating buttonholes for the groomsmen or even gift them as individualised personal favours to each man involved in the wedding. You could use initials like that of a scrabble block, or even a photo of the two of you together. 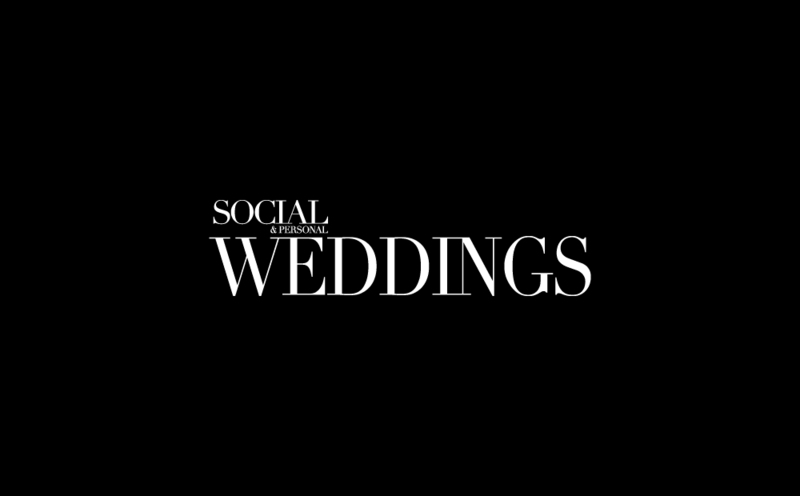 Either way, the groomsmen will be certain to appreciate the thought and sentiment and they will no doubt serve as nostalgic mementoes for the years to come. Likewise, don’t forget to include the page boy if you’re opting for a coordinated wedding party. 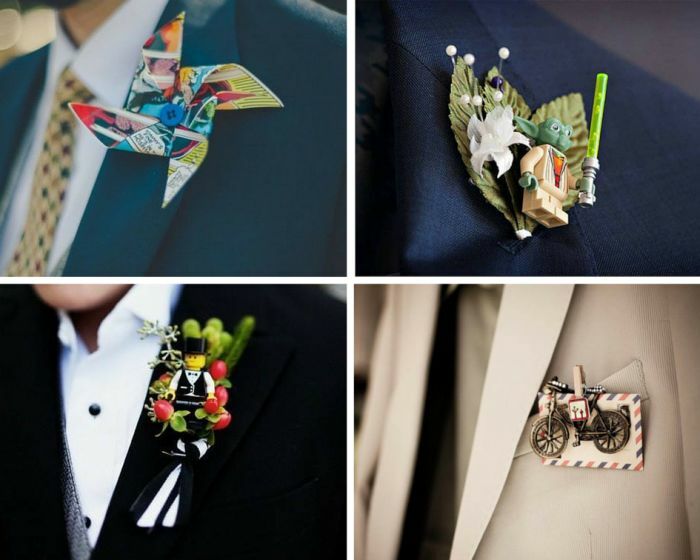 A very fun and unique idea, and a definite eye catcher, is the use of Lego men in the buttonhole. A little out there and very quirky, these playful characters will both brighten up your suit or the suit of the children and boys, and definitely brighten up the wedding guests faces. Just like Lego, you can incorporate the boutonniere into whichever general theme or décor that has been decided on for the wedding. Say if it’s a grand baroque style affair with champagne towers and art deco table settings, feathers and crystal buttonholes would suit perfectly. Similarly, if the wedding is set to be a fairy-tale party, then you could incorporate a vintage page from a favourite book or a storybook character. No matter which décor has been decided on, the buttonhole will always have the option to incorporate a little further detail and fun. If it’s a little less male comradery you’re looking to exhibit and a little more ‘you’re the one I love’, there are plenty of options to make the buttonhole truly romantic and in honour of your bride to be. This can be as romantic as including a trinket that had a personal meaning only to the pair of you, which will allow you to embrace that fond shared moment just between you two, whilst standing in front of a crowd of people. Another innovative way to accessorise your suit on the day is to incorporate your loved ones. A buttonhole can be a great way to include either a photo or personal belonging of loved ones who may not be with you any longer, to ensure that they will be present on your big day in spirit. Trust us, with these handpicked inspiring and adorable buttonhole choices, you’re courageous and admirable style choice will certainly be applauded.